San Diego History Center’s History Happy Hours are a public program that have been running in congruence with the exhibition Bottled & Kegged: San Diego’s Craft Brew Culture. Each month the center invites a brewer to speak for about 30-45 minutes to a group of about 150-200 people, sample their beer, see the exhibition, and eat amazing food from the city’s coolest restaurants. On November 1 from 5:30-7:30pm, the SDHC will be teaming up with Stone Brewing Co. and Soda & Swine. Don’t miss this chance to see the exhibition, Bottled & Kegged: San Diego’s Craft Brew Culture and taste some of the finest craft beers from Stone Brewing Co., while muching on delicious offerings from Soda & Swine. Speak to the brewers themselves in the exhibition that explores the history they are currently creating! Bottled & Kegged explores the ebb and flow of beer production in the San Diego region over the years and answers the question: Why is San Diego becoming such a nationally renowned region for craft beer production and innovation? Beginning with the region’s earliest inhabitants to the present day, the exhibit highlights events and individuals who built a brewing industry where once there was none, kept an industry alive during Prohibition, and managed to bring back what, at one time, was one of the region’s most robust enterprises. 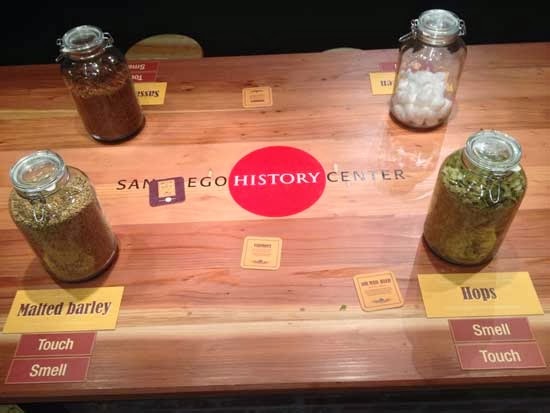 The exhibit features many hands-on interactive elements that help explain: the brewing process, how San Diego County brewers achieve such expansive flavor profiles, and the science behind matching beers with food. 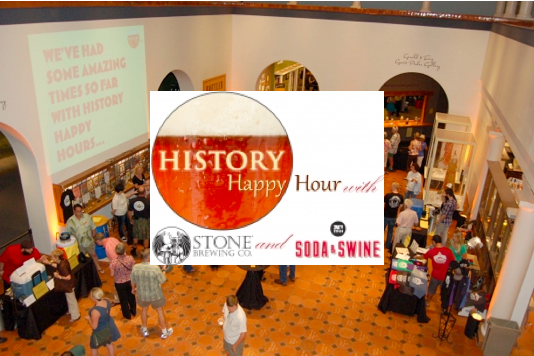 SDHC's History Happy Hours are 21 and over events and tickets cost $20 in advance and $25 at the door. Admission gets you into the Bottled & Kegged exhibition, samplings of several of the region’s best-tasting craft beers paired with light appetizers and a 4oz. commemorative tasting glass. For more information, visit sandiegohistory.org/calendar/detail/54384.